Representatives from Children’s Regional Hospital at Cooper visited St. Anthony of Padua School in Camden on Thursday, April 12, 2018, to accept several dozen handmade “heart hug” pillows crafted by sixth, seventh, and eighth grade students as part of a community outreach project. The pillows will be given to hospitalized children at Cooper. 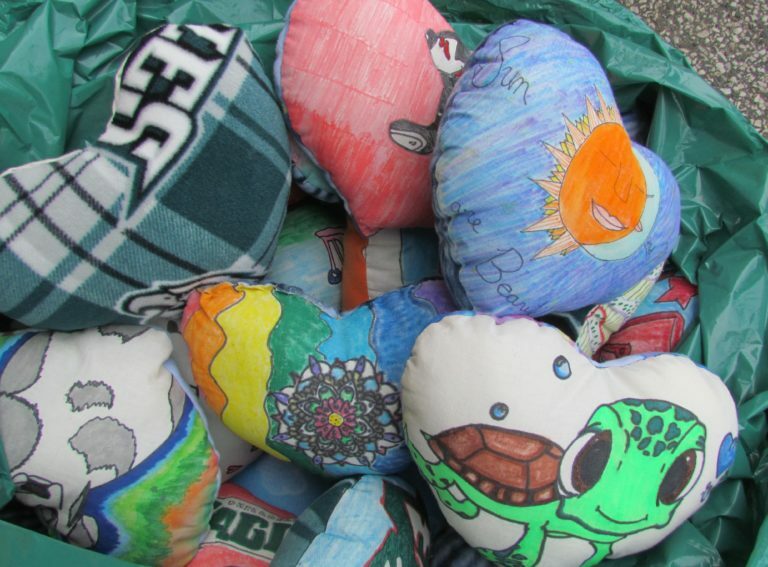 The “Heart Hug” pillow project was initiated by Linda Burns, an art teacher at St. Read more. More than 125 kindergartners from the KIPP Cooper Norcross Academy visited Cooper University Health Care on April 11, 2018, to take part in the annual “Teddy Goes to Cooper” event. The Teddy Goes to Cooper program was developed to help alleviate young children’s fears of visiting the hospital or the doctor while teaching them healthy habits. Each child received a teddy bear and rotated through different stations where Cooper physicians and other health care professionals diagnosed and treated the bear’s ailments using real tools and equipment. Read more. Melvin Sheppard, 20, of Moorestown, NJ, visited the Neonatal Intensive Care Unit (NICU) at the Children’s Regional Hospital at Cooper University Health Care to donate the proceeds of his annual penny collection. Melvin started the tradition 12 years ago as a token of thanks for the medical care he received as a premature infant at Cooper. When he was born, he weighed only 2.9 pounds. Read more. (Camden, NJ) — Pediatric patients at the Children’s Regional Hospital at Cooper enjoyed a special story time on November 22, 2016. Local author Lori Samlin Miller read from her recently published children’s book, Stay Where I Can See You. The Cooper Foundation provided copies of the book for all the children on the unit. As a wife, mother, teacher, writer, and volunteer at Cooper University Health Care, Lori Samlin Miller is a strong supporter of children’s literacy. Read more. On Thursday, February 26, 2015, representatives of the Children’s Regional Hospital at Cooper visited St. Anthony of Padua School in Camden to accept a gift of 65 handmade “Heart Hug” pillows to be given to hospitalized children. The “Heart Hug” pillow project was initiated by Linda Burns, an art teacher at St. Anthony of Padua School, as a way for students and their families to engage in community service. Read more. Preparing to go for a MRI appointment can be an intimidating and frightening experience for any patient, especially young children. For a normally active and vibrant child, trying to get them to lie motionless for a prolonged period of time in a sometimes small, dark and enclosed area can be a daunting task. As the incidence of autism continues to increase, The Children’s Regional Hospital at Cooper is teaming up with Autism Speaks to promote Autism Awareness Month by illuminating the hospital blue. During April 1 and April 2, blue lighting will be seen in front of Cooper’s Pavilion in support of individuals with autism and their families. Dr. Grewal joins Cooper from Temple University School of Medicine where he served as the Chief, Section of Pediatric Surgery and Professor of Surgery. During his time at Temple, Dr. Grewal also served as the Medical Director of Pediatric Trauma, Director of the Surgical Skills Laboratory, attending surgeon at St. Christopher’s Hospital for Children, and staff consultant for Shriner’s Hospital for Children. As students file into Jace Dutweiler’s Flex Time technology period at Logan Elementary School in Logan Township, they grab kits of Legos and begin to build elaborate projects. Inspired by concepts in The Shut-Down Learner, by Richard Selznick, PhD, for 30 minutes each day this “special” period allows students to show personal gifts that may not show in the regular classroom.